NNTMA is a proud supporter and partner of May is Bike Month. This grassroots campaign, promotes and rewards bicyclists throughout the Sacramento region. Individuals, employers, schools and entire cities are invited to participate in a month-long challenge to log trips to see who can claim the most miles ridden. Go to MayisBikeMonth.com for details, and while you're there, check out their event calendar. There are group rides and bike maintenance clinics held throughout the region. The weather couldn't be better, so what are you waiting for? Share your ride on social media with #iBikeNN! During the 31 days of May is Bike Month, follow the month's events and learn a thing or two on NNTMA's Twitter and Facebook feeds. You'll find 31 bicycle-centric questions to get you thinking and conversing, plus a lot more. From the silly to serious, creative to practical, we will leave no question unanswered. Keep an eye on the leaderboard to see how North Natomas schools rank against other schools in the region. Our free pop-up bike repair station is coming to schools, housing developments and community events near you. Better known as Bike Doc, our mobile mechanics are in full springtime swing. Mark your calendar and come by. We'll help adjust, fix, inflate, tune up and grease your trusty ride. Includes a helmet sale, new helmets just $5! We are delighted to celebrate the recognition of two of the very best NNTMA has to offer. 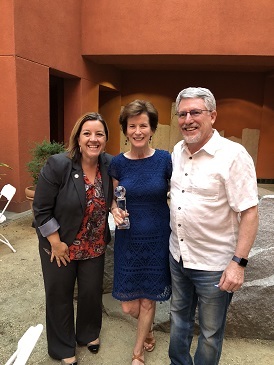 Executive Director Becky Heieck received a Clean Air Leadership Award from Breathe California Sacramento Region. We are proud of the work she does to support a community where bicycling, walking, ride sharing and transit are all valued. 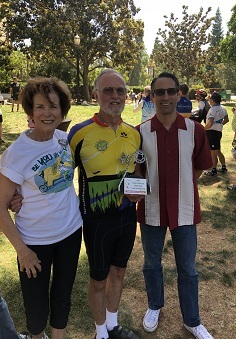 Additionally, our dear super-volunteer David Baker was recognized as the NNTMA Cyclist of the Year at the Celebration of Cycling picnic held at the State Capitol. David proactively and publicly promotes the benefits and virtues of cycling as a way of transportation; leading by example, advocating for cycling and supportive facilities, teaching cycling skills, and encouraging others to start cycling. Thanks to their dedication to make North Natomas a better community to live, work and play in. On Saturday, May 5, over 40 riders joined together to celebrate May is Bike Month with a 23 mile ride from North Natomas through downtown and back. We rode the American River Bike Trail, over the Guy West Bridge through Sac State, through the Fab 40's, past McKinley Park, by Blue Diamond Almond Growers and back north, via the Ueda Bike Trail. It was a great ride and opportunity for local riders to see old friends and make new ones. Click here to plan your next adventure with ride maps and directions! Now there are more places where you can park, ride and repair on the fly. Available at the North Natomas Regional Park, there is a bike corral with space for up to 20 bikes. Not only is this convenient for cyclists, it also legitimizes and promotes biking as a form of transportation by converting the prime location car parking stalls to bike parking. Make use of this biking opportunity when the Farmers Market opens for the season on May 19th. Go ride in our local parks! 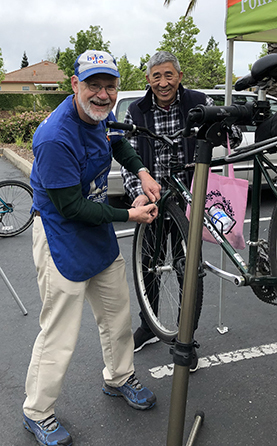 In addition, North Natomas Library, Witter Ranch Park, Heritage Park Clubhouse or Natomas Park Clubhouse all have self-service fix-it stations equipped with freely available bike tools and a pump. Looking for a commuting partner? Want to expand your bike crew? There's a Facebook group called Ride Together, North Natomas that makes it easy to find people who share your love of biking and get tips for riding in the area. And of course, everyone is invited to share their stories and selfies. Pics or it didn't happen! It's important that young people enjoy biking responsibly and safely. If you're a teacher or a parent, here's an educational tool you'll appreciate. The Project Ride Smart video series is made for kids, but adults won't mind watching it together with them. Hosted by two quirky young teenagers, the program is divided up into a series of short vignettes that entertain and inform.